Physically-Based Rendering allows accurately simulated lighting for photorealistic graphics, all in real-time. Parallax Mapping provides extreme detail made possible by textured heightmaps. Detail Maps enhance visuals with macro or micro surface detail. Environment Lighting gives greater control for direct, indirect and High Dynamic Range lighting. NVIDIA Turf Effects empowers route builders to simulate realistic ground cover on a vast scale. Lay down Animated Ground Cover that waves in the wind. Customisable Ground Clutter fills your route with micro-detailed objects. Enhanced Bulk-Replace tool to quickly update your existing routes to new standards. Track Navigation Profile displays key information for improved driving accuracy. Train Control Mode toggle to change instantly between Simple, Realistic and AI Command modes. Driver Control Center to control and manage dozens of AI Drivers. Command Properties editable in real-time to update your Driver AI Commands on the fly. My Collection allows you to view all your installed locos and rolling stock quickly and easily. Search Routes, Sessions and Rolling Stock in the new menu UI. Filter by Content Type, Source, Region and more. Tag your “Favorites” for easy display and selection. 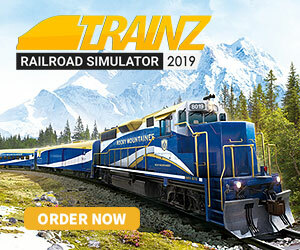 Search and download from the Trainz Download Station directly in-game. In TRS19, you can edit and update all the built-in and “DLC” routes and sessions. Customise the terrain and ground textures. Add or bulk replace track and trackside objects. Increase or decrease the density of scenery assets. 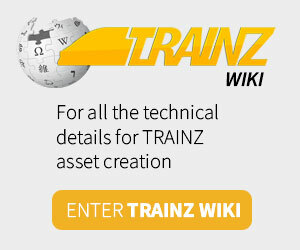 Share your edits with other content owners via the Trainz Download Station. Picklists – add selected items to your selected picklist. Raildriver Support – TANE and TRS19 both support Raildriver controllers. Seasonal Support for procedural track. FBX mesh support providing support for more 3D art tools, and PBR materials. Each route utilises all the latest TRS19 content and features and is fully editable by you! Completely overhauled and updated to TRS19 Standards. In recognition of all our Kickstarter supporters we’ve made some major updates to KSC by completely overhauling and updating the route to TRS19 Standards. Includes 4 brand new interactive sessions, new industries and an expanded world. Majestic prototypical Rocky Mountains route by RoysTrainz. This enormous 2000 km sq prototypical Rocky Mountains route has been extensively reworked to take full advantage of the new TRS19 features. Includes 4 brand new interactive sessions plus stunning new high resolution trains and passenger cars. Brand new masterpiece from Jango This stunning creation is a must-see for every Trainz fan. With an incredible eye for detail and the majestic Italian scenery as a backdrop, this prototypical rural Italian route is a true masterpiece. Includes 6 brand new interactive sessions and the stunning new Orient Express train. Completely overhauled and updated to TRS19 Standards. An idyllic, single-track branch line in Wetterau and Main-Kinzig-Kreis in the western German state of Hesse. New Track and Scenery plus 4 new sessions with new detail rolling stock. Completely overhauled and updated to TRS19 Standards This impressive route runs between Truro and Penzance in Cornwall. It includes Branch-lines to Falmouth, Helston, Hayle Wharves and St Ives. New Track, Ground Textures, Assets and 8 new never-seen-before sessions. Completely overhauled and updated to TRS19 Standards. Set in 1976, this well-known ECML route includes the Forth and Tay rail bridges, Rosyth Navy Dock and stunning scenery along the Firth of Forth estuary. Keep an eye out some good gradients and also some severe speed restrictions while learning the road. PLUS NEW LOCOS, ROLLING STOCK AND MORE! TRS19 is not just about the built-in routes. We’ve also included a huge range of new locos, rolling stock and scenery, with over 15,000 items in total. Plus we’re working on a new range of brand new high quality TRS19 DLC content.